The Barbara Hepworth Museum was opened in 1976 by Hepworth's family, following the wishes expressed in her will. The Museum has been owned and run by Tate since 1980. It contains the largest group of Hepworth's works, permanently on display at Trewyn Studio and garden where she lived and worked from 1949 until her death in 1975. The monumental Walk Through in the garden of the Museum was the subject of a major conservation project in May 2017, fifty years after Hepworth placed it there. The variety of patination present in this work, including the golden hollows, is once again visible following years of weathering in the marine environment. Cleaning and waxing has also brought out the tool marks that were made by Hepworth over the surface in the wet plaster prototype from which the bronze was cast. The project was based on new research and conservation techniques, which have also been employed in the conservation of The Family of Man at Yorkshire Sculpture Park in recent years. In April 2016 the fortieth anniversary of the Barbara Hepworth Museum was marked by the commission of a new composition by Leo Geyer, Guarea, which was premiered there. Written for solo violin, it was inspired by three guarea wood carvings of the 1950s, Delos, Corinthos and Delphi. The two exterior studios, used for carving and working in plaster for bronze, were the subject of an important conservation project by Tate in 2013-14, to enable them to be preserved, enjoyed and re-interpreted for the future. 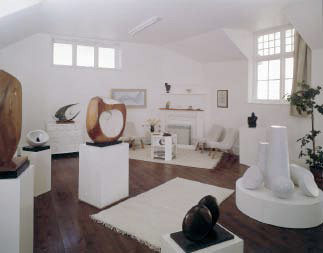 Hepworth acquired Trewyn Studio in the centre of St Ives in September 1949 and immediately began working there; she also lived there permanently from December 1950 until her death. "It is completely perfect for me", she wrote to Philip James, Director of Art at the Arts Council, on 29 August 1949. Over this 25-year period, her working practice and her uses of the studios evolved. The stone carving studio and yard - which should be thought of together - were at the heart of her creative life consistently throughout this time, in a way that none of the other spaces she used as studios were. At the same time, they cannot be considered in isolation from those other spaces. Hepworth initially used the large upper room of the house primarily for her wood-carving (she was still living at Chy-an-Kerris, the family home in Carbis Bay, for the first year). Gradually (it was a hybrid space for a period) this room became her chief living space, as well as her bedroom, and was no longer used for carving and painting, with the kitchen, eating area and bathroom on the ground floor. Early in 1950 the two huge blocks of Galway limestone arrived from which Hepworth carved her Festival of Britain commission, Contrapuntal Forms. A series of photographs show the progression of the work, which was finished in March 1951. Hepworth took on permanent assistants for the first time especially to assist with this, her largest commission to date - the first were John Wells, Denis Mitchell and Terry Frost. At Trewyn what she had, effectively, were a large shed (described as a 'store' in the catalogue to the auction at which she bought Trewyn) and a greenhouse. Plants and possibly a bird-cage can be seen in the upper studio; the Carving Studio was much lower, with a conventional door. This was altered in 1957 to the form we know today, being raised to the same height as the upper studio, with large ten foot doors. The greenhouse above was part of the acquisition Hepworth made in 1965 from her neighbour the sculptor John Milne. This included the strip of land at the top of the garden; and at the end of her life, Milne sold another piece of land where Hepworth placed Conversation with Magic Stones, her final monumental, multi-part bronze (1973). When Hepworth took up bronze in 1956, the upper of the two outdoor studios began to be used for making the plaster prototypes (although whatever space was most practical was used: there was no clear-cut division). Access to the upper studio was only through the door from the carving studio, so its use was restricted. Hepworth used both of the studios for her plasters, according to her needs, as well of course as the yard whenever the weather allowed (she always worked outside as much as possible). As a general rule, however, the upper studio was used for work on the plasters and the lower for stone and marble carving. They are not large spaces and her prototypes were always made at the same scale as the resulting bronze, so that when she received the commission for Meridian for State House, in London's High Holborn, she needed to rent a studio nearby. When at the beginning of 1961 Hepworth was able to buy the Palais de Danse, a former cinema and dance hall opposite Trewyn, her working facilities were greatly expanded. She immediately put the Palais to use to carry out her major commissions, beginning with Winged Figure for John Lewis and quickly followed by Single Form for the United Nations headquarters in New York. The constrictions of space that Hepworth was increasingly finding at Trewyn were resolved at a stroke. Fallen Images (1974-5) was Hepworth's last major carving and it was completed shortly before she died. Immediately before her death, Hepworth had 15 tons of Carrara marble delivered to Trewyn. These blocks were placed in the yard, waiting to be carved, "like a flock of patient sheep", as she put it in her last interview. A group had been placed on the turntable in preparation for a new multi-part carving. 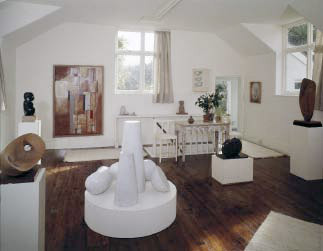 In keeping with Hepworth's wishes, Alan Bowness, in consultation with the other Trustees of her Estate, undertook to set Trewyn up as a Museum after her death. He wanted to retain the atmosphere of an artist's house and workplace, and not to create the feeling of a museum as far as possible. The carving studio was kept as far as possible as it was when Hepworth died, specifically as a stone carving space; the plaster studio needed more shaping to make it coherent, to give it meaning and interest. For the Museum, a clear separation was made between the two spaces. To make for clarity of presentation, some of the ad hoc sense of their use has perhaps gone. It was an informal presentation, without interpretation beyond Alan Bowness's accompanying Guide. Materials and tools were left as they were or re-arranged. This was done by George Wilkinson, Barbara's assistant who stayed on after her death, working to Bowness's instructions. As a general rule, nothing was placed in the studios that had not been in them at some time in the past. There are two sequences of photographs that record the studios as they were shortly after Hepworth's death. The local photographers she had used since 1944, Studio St Ives, took a series in July 1975, and Norman Reid took a group in early January 1976 when he came down for a few days to help with preparations. Reid, who was both Director of the Tate and a Trustee of the Hepworth Estate, showed these photographs to the Tate Trustees on 15 January and reported on the progress that had been made in setting up Trewyn. In preparing the two studios for opening as part of the Museum, perhaps the most significant change was to move the plaster Delos II (1973-, BH 573) from the carving studio up to the plaster studio (it had probably been moved down to the stone studio in readiness for the foundry). This was the nearly complete plaster that had been cast from the guarea wood carving of 1955, Oval Sculpture (Delos), now in the National Museums and Galleries of Wales, in order to cast a bronze edition from it. Hepworth had already given it a BH catalogue number and had had it photographed in June 1974, which indicates how near it was to completion. The elements of the marble carving with three spheres, which was quite far advanced, were grouped closer together. Hepworth told Alan Bowness at Easter 1975 that these were to have circles incised on them and the three parts placed on top of one another, in a manner comparable with Small One, Two, Three (Vertical), 1975, (white marble, BH 579), one of the very last works to be completed. The two parts of a second marble in progress were also brought together (the smoother block was brought in from the yard). George Wilkinson and Alan Bowness knew they belonged together and were to have formed a two-part sculpture. A selection of stone carving tools was placed just inside the door for visibility. These tools were selected by Wilkinson, under Bowness's supervision, from those that were in the studios, and probably also from the Palais. Photographs show the Plaster Studio immediately after Hepworth's death, a slightly forlorn space, which was then re-populated in making the Museum. A selection of tools was arranged in the window (steps were built to allow for viewing). Unfinished plasters from different periods were moved in from the Palais store to join those already in the studio. Several unfinished aluminium mesh plasters at different stages of completion were also brought in: they represent Hepworth's earlier way of working in plaster for bronze, building plaster up on chicken wire armatures. Her practice was to shape it wet and carve it down when dry. One of the two plasters for Three Oblique Forms (February) was taken from the Palais to display in the Plaster Studio (the other is now in The Hepworth Wakefield, part of the Gift made there in 2011). On the shelves in the Plaster Studio are two other plasters of 1967, Two Forms (Orkney) and Three Forms (Tokio), not assembled, which were probably returned to Hepworth following casting (assembled versions of both are in Wakefield). These are solid plasters, without armatures. Relatively few plasters in the Plaster studio were used to cast bronze editions. Vertical Form, 1962, probably also falls into this category (BH 353). The small solid multi-part geometrical plasters in the Plaster Studio were works in progress. Two of the groups were already there and one was probably either added or brought out. These appear to be examples of a new departure in Hepworth's working methods, of making small plaster maquettes for her large multi-part marble carvings and bronzes (some have titles inscribed on them from The Family of Man). She had apparently made one for Fallen Images. She had not previously used either plaster or maquettes in this way. The prototypes and objects around the walls were largely left, though some were re-arranged or made more visible. These include the unfinished plaster Variation on a Theme, dating from 1958. And there is another trace of the Meridian series - the numbered grid that was drawn on a piece of board, placed behind the plaster for Garden Sculpture (Model for Meridian), 1958, and used to scale the model up (it echoes the curved wall behind Meridian at State House). Also here are elements from Hepworth's first proposal for the John Lewis commission, Three Forms in Echelon, at a 1/3 scale, in plaster and expanded aluminium. These were abandoned when her proposal was rejected and replaced by Winged Figure. The upper studio was also used for print-making. Stanley Jones of Curwen Prints came down and worked here with Hepworth in 1968 and 1970, and there are materials still in the studio remaining from his time there. He had first worked with her in St Ives in 1958. There is also a lithographic stone with an unfinished drawing here, probably dating from the late 1950s (a trial lithograph taken from this stone is in the Tate Archive). Finally, for the Museum, a selection of the unfinished wood carvings from the Palais was used to evoke this third process, the carving of wood, in the former bathroom on the ground floor of main house. At the end of Hepworth's life, Trewyn garden was very crowded with sculptures. A complete set of The Family of Man was present, for example, for which Hepworth was looking for a site (this has been at Yorkshire Sculpture Park since 1980). It was taken out of the garden in preparation for the opening of the Museum, together with other works such as casts of Sea Form (Atlantic), Square Forms with Circles, Dual Form and Single Form (Eikon).